Our range of products include silo feeding system and cement feeding system. We offer pneumatic conveying systems for cement bulker unloading twin lobe high volume low pressure blower makes it easy to unload the bulkers within hour. 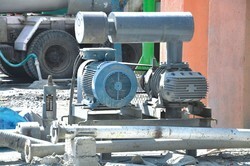 Reduces the dependability on the availabity of compressor mounted bulkers only. Looking for Feeding System ?